Spring in San Diego is all about enjoying the warm weather outdoors. 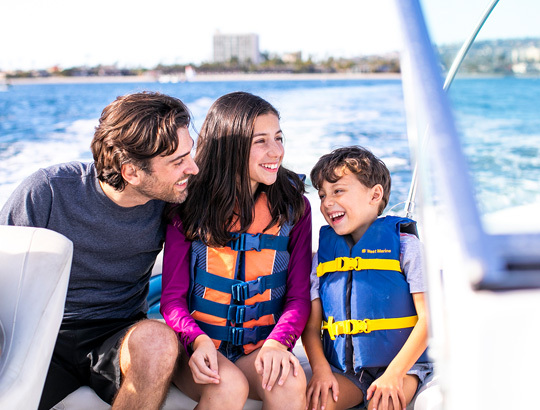 From open-air yoga and movies on the bay to poolside entertainment and happy hour specials, the Catamaran has a full lineup of spring resort activities to get the most out of the season. Spring Activities will start March 4 through April 21, 2019. 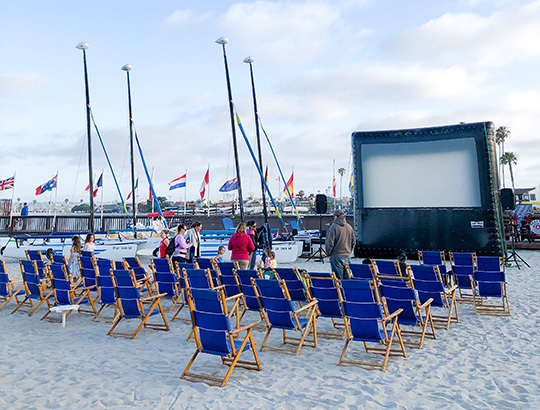 Complete with popcorn and beach chairs, catch a family friendly flick at the complimentary outdoor screenings. Relax with an entertaining film and a backdrop of the sparkling bay. Dates subject to availability. 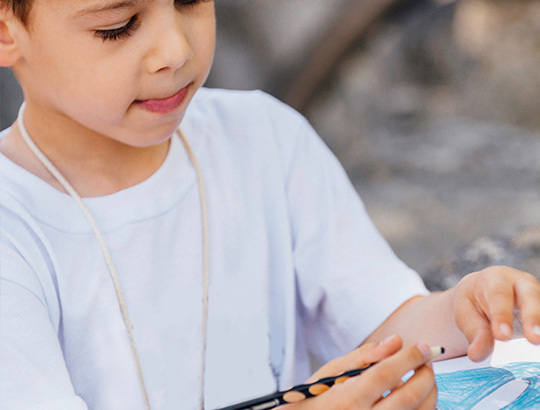 Wednesday, Friday, Sunday | 7:00 p.m.
Children of all ages can show off their creative side during their stay at the Catamaran. Families can head to the pool for the Keiki Club’s fun and interactive Hawaiian-inspired arts and crafts activity. Your fitness routine just received an open-air upgrade at the Catamaran. 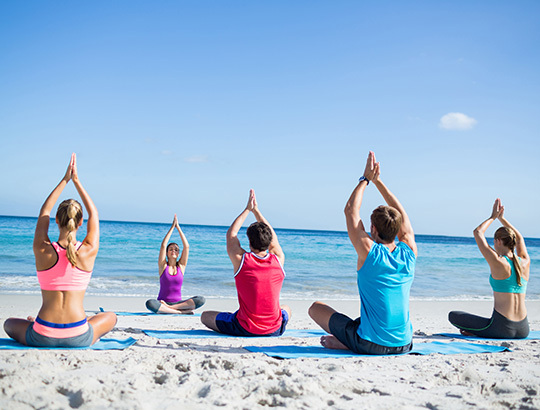 Work on your tree pose and downward dog surrounded by the calm winds, warm sunshine, and relaxing views of Mission Bay. 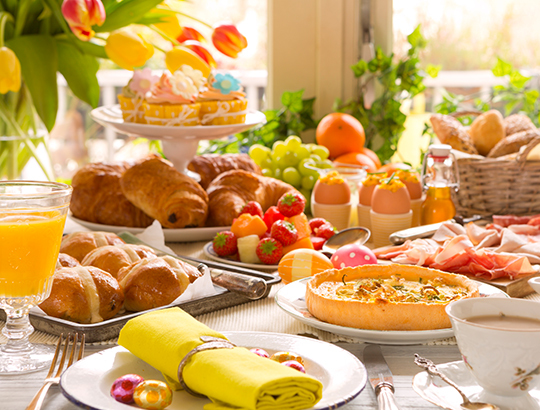 Wednesday, Saturday | 9:00 a.m.
Get into the spirit of the islands without leaving the relaxing pool area at the Catamaran. 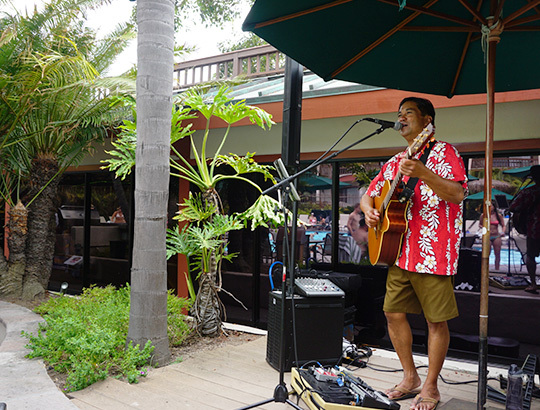 Sway to live Polynesian-inspired musical entertainment while you take a dip in the pool or enjoy your favorite tropical drink. Saturday - Sunday | 1:00 - 5:00 p.m. Weekdays are meant for happy hour at Moray’s. 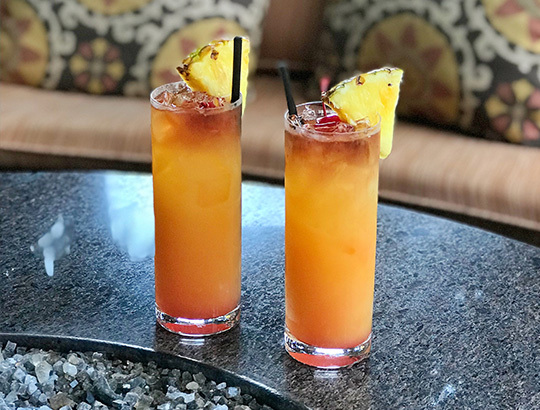 With special pricing on drinks and appetizers perfect for sharing, grab a seat among the tropical landscaping and sip your favorite libation for less. 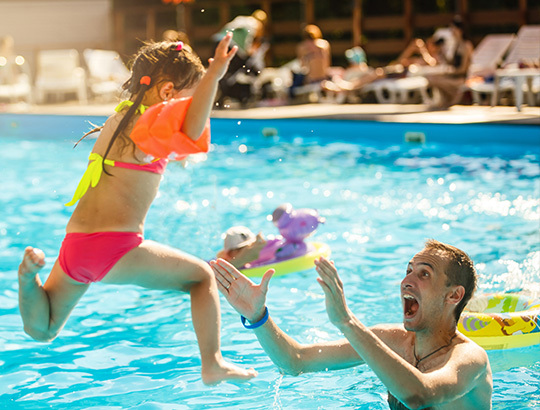 Monday - Friday | 3:00 p.m. - 6:00 p.m.
A tropical oasis in San Diego, the Catamaran Resort Hotel and Spa is a playground for all ages. Guests enjoy access to a myriad of resort activities and exciting things to do, see, and eat, without leaving the beautiful Mission Bay property. Lounge on the Catamaran’s beach chairs and enjoy the soft sandy shores, gentle sea breezes, and relaxing views of Mission Bay. 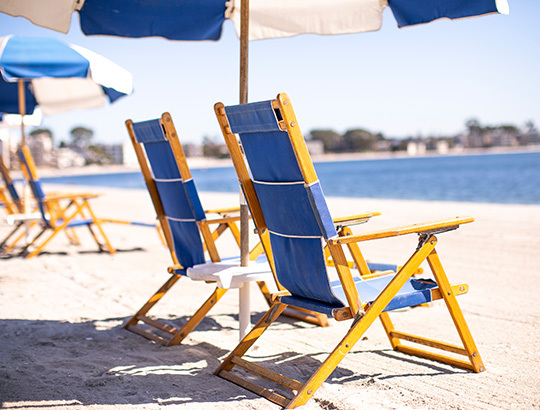 These chairs are on a first come first serve basis and are set up with an umbrella, so you can choose shade or sun for your beach day. Surrounded by towering palm trees and lush scenery, the inviting pool atmosphere at the Catamaran is a great way to unwind and have fun with your friends and family for an unforgettable San Diego vacation. Open Daily | 9:00 a.m. - 10:00 p.m.
After a long day of exploring San Diego, the on-site whirlpool is a welcoming setting for warming up, soaking and relaxing. Located in the pool area, you can switch between the whirlpool and the pool depending on your mood. A unique experience at the Catamaran, families can gather for an interactive show with our feathered friends, the colorful talking macaws. 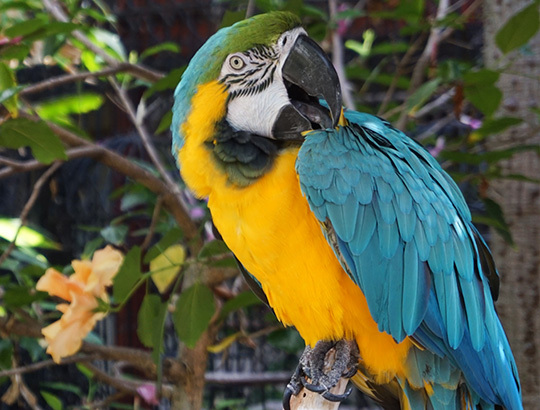 Don’t miss this special photo opportunity with these beautiful exotic birds. 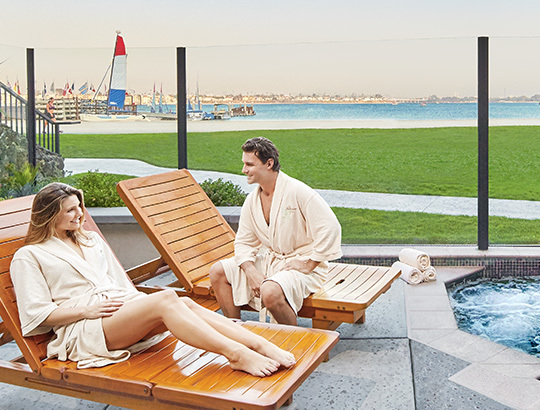 Relax and rejuvenate at San Diego’s only beachfront spa. With options for massages, facials, body wraps, and more, the treatments at The Catamaran Spa are inspired by South Pacific and Asian healing traditions. 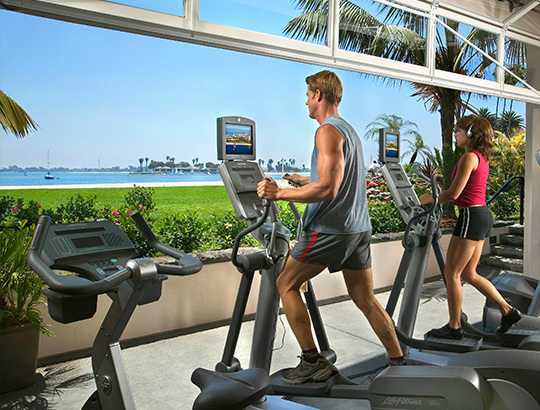 Open Daily | 8:00 a.m. – 9:00 p.m.
Just steps from the beach overlooking Mission Bay and the boardwalk, the on-site fitness center features the latest workout equipment and lets you take in the view while you spend time focusing on your wellness. 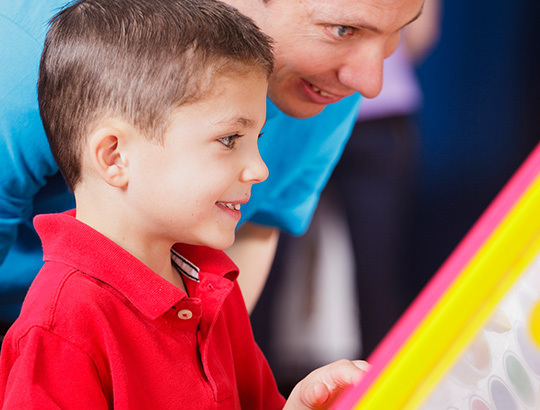 Open Daily | 6:30 a.m. - 9:00 p.m.
A favorite activity for the kids, the hotel’s arcade offers wholesome entertainment with classic gaming fun. The arcade is located in the pool area for a convenient shaded activity option when a break from the sun is needed. With two on-property locations, Action Sports Rentals offers the best rental equipment available for exciting outdoor activities including standup paddle boarding, kayaking, sailing, and biking around the bay. 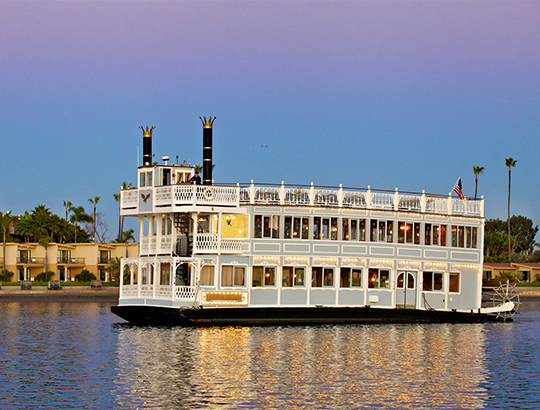 Our classic sternwheeler, the Bahia Belle, provides complimentary family-hour and cocktail cruises on Mission Bay for our valued guests. After 9:30 p.m., the boat transforms into a floating nightclub for guests 21 and older.